Advance the Game to the next level of play! The advanced first edition game as you remember it. Labyrinth Lord gives you the play experience of the old editions of the world’s most popular fantasy roleplaying game! 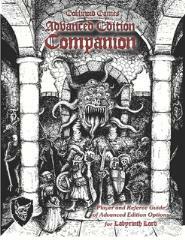 The Advanced Edition Companion is a handbook of advanced player and referee options. Play the race and class possibilities from the “advanced” first edition 1978 rules. Introduce the essential first edition monsters, spells, and magic items to your Labyrinth Lord game. All of these options are fully compatible with the core Labyrinth Lord rules, so that you can continue to play race-classes right along with all of the advanced classes and races.